January 14, 2011 – Ben Ali, former Tunisian president, fled the country to Saudi Arabia after popular protests (dubbed as Jasmine Revolution) requesting his departure. 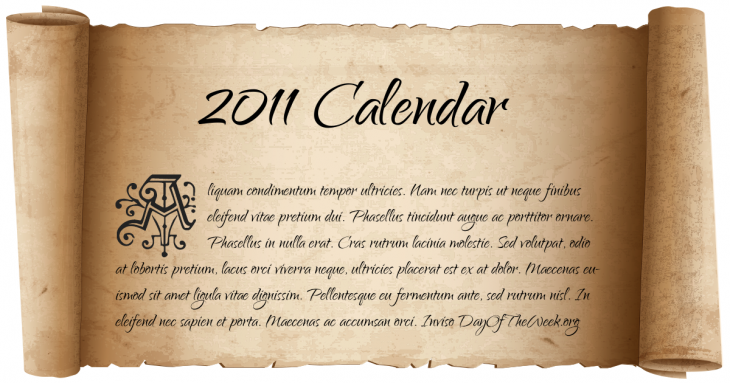 February 3, 2011 – New Year’s Day in Chinese calendar. Start of the year of the Metal Rabbit in Chinese astrology. March 12, 2011 – A reactor at the Fukushima Daiichi Nuclear Power Plant melts and explodes and releases radioactivity into the atmosphere a day after Japan’s earthquake. April 9, 2011 – A gunman murdered five people, injured eleven, and committed suicide in a mall in the Netherlands. July 11, 2011 – Neptune completes its first orbit since its discovery on September 23, 1846. August 18, 2011 – The West Memphis Three are released from prison after 18 years in imprisonment. August 23, 2011 – Libyan leader Muammar al-Gaddafi is overthrown after the National Transitional Council forces take control of Bab al-Azizia compound during the 2011 Libyan Civil War. November 25, 2011 – Sudden violent storms strike southern Sri Lanka, killing 27 people and drowning many fishermen caught by surprise. Thousands of homes lose their roofs and several more sustain damage. Landslides along with flooding was reported on the mainland. Who Was Born On 2011?